German humanist; born Feb. 22, 1455, at Pforzheim; died June 30, 1522, at Liebenzell, near Hirschau, Württemberg. He studied at the universities of Freiburg, Paris, and Basel (1475-78). After having served the Duke of Württemberg as companion, judge, and ambassador (1481-96) he was appointed councilor by the Duke of Baden (1496-99), and, returning to Württemberg in 1499, he again became judge at Tübingen, which position he resigned in 1513. From 1519 to 1521 he was professor of Greek and Hebrew at the University at Ingolstadt; and from 1521 till his death he held a similar chair at the University of Tübingen. Reuchlin, who was one of the leaders of the German humanists, introduced the study of Greek and especially of Hebrew into western Europe, and was with Luther, Melanchthon, Erasmus, and Hutten among the promoters of the Reformation, although he declared himself against the movement in 1520. During his second visit to Rome (1490) Reuchlin became acquainted with Pico di Mirandola at Florence, and, learning from him about the Cabala, he became interested in Hebrew; but not till 1492 could he find an opportunity to learn that language; his teacher was the emperor's physician, Jacob Loans. From that time he became an ardent student of Hebrew, having for a second teacher Obadiah of Sforno, during his third stay in Rome (1497-99). His researches into the language of the Bible led Reuchlin to study the Talmud and the Cabala also. 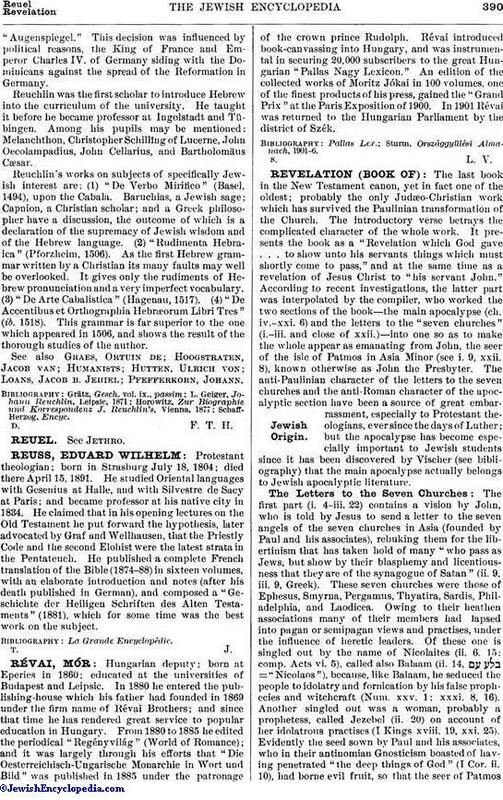 Pfefferkorn, a baptized Jew from Cologne and a follower of the Dominican friars, had succeeded in 1509 in obtaining from the emperor Maximilian of Germany an order for the destruction of all Hebrew books found in the possession of the Jews of Cologne and Frankfort. The Jews appealed, and Reuchlin was asked in 1510 to give his opinion upon the case. Reuchlin's report was favorable to the Jews. He divided the Jewish literature into seven classes, in one of them being the Old Testament; and, judging these classes singly, he arrived at the conclusion that the Talmud, the cabalistic book the Zohar, the commentaries of Rashi, the Ḳimḥis, Ibn Ezra, Gersonides, Naḥmanides, etc., should not be burned, as they were useful for theology and science, and no heresy was contained in them; but books which contained blasphemies against Jesus, such as the "Toledot Yeshu," he considered ought to be destroyed. Furthermore, the Jews, being as such under the protection of the German empire, could not be accused of heresy against Christianity. The emperor rescinded his edict of destruction on May 23, 1510. 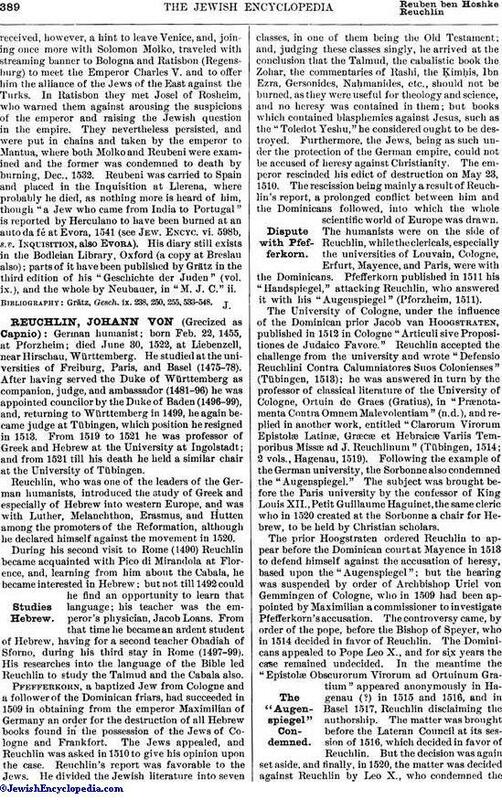 The rescission being mainly a result of Reuchlin's report, a prolonged conflict between him and the Dominicans followed, into which the whole scientific world of Europe was drawn. The humanists were on the side of Reuchlin, while the clericals, especially the universities of Louvain, Cologne, Erfurt, Mayence, and Paris, were with the Dominicans. Pfefferkorn published in 1511 his "Handspiegel," attacking Reuchlin, who answered it with his "Augenspiegel" (Pforzheim, 1511). The University of Cologne, under the influence of the Dominican prior Jacob van Hoogstraten, published in 1512 in Cologne "Articuli sive Propositiones de Judaico Favore." Reuchlin accepted the challenge from the university and wrote "Defensio Reuchlini Contra Calumniatores Suos Colonienses" (Tübingen, 1513); he was answered in turn by the professor of classical literature of the University of Cologne, Ortuin de Graes (Gratius), in "Prænotamenta Contra Omnem Malevolentiam" (n.d.), and replied in another work, entitled "Clarorum Virorum Epistolæ Latinæ, Græcæ et Hebraicæ Variis Temporibus Missæ ad J. Reuchlinum" (Tübingen, 1514; 2 vols., Hagenau, 1519). Following the example of the German university, the Sorbonne also condemned the "Augenspiegel." The subject was brought before the Paris university by the confessor of King Louis XII., Petit Guillaume Haguinet, the same cleric who in 1520 created at the Sorbonne a chair for Hebrew, to be held by Christian scholars. The prior Hoogstraten ordered Reuchlin to appear before the Dominican court at Mayence in 1513 to defend himself against the accusation of heresy, based upon the "Augenspiegel"; but the hearing was suspended by order of Archbishop Uriel von Gemmingen of Cologne, who in 1509 had been appointed by Maximilian a commissioner to investigate Pfefferkorn's accusation. The controversy came, by order of the pope, before the Bishop of Speyer, who in 1514 decided in favor of Reuchlin. The Dominicans appealed to Pope Leo X., and for six years the case remained undecided. In the meantime the "Epistolæ Obscurorum Virorum ad Ortuinum Gratium" appeared anonymously in Hagenau (?) in 1515 and 1516, and in Basel 1517, Reuchlin disclaiming the authorship. The matter was brought before the Lateran Council at its session of 1516, which decided in favor of Reuchlin. But the decision was again set aside, and finally, in 1520, the matter was decided against Reuchlin by Leo X., who condemned the"Augenspiegel." This decision was influenced by political reasons, the King of France and Emperor Charles IV. of Germany siding with the Dominicans against the spread of the Reformation in Germany. Reuchlin was the first scholar to introduce Hebrew into the curriculum of the university. He taught it before he became professor at Ingolstadt and Tübingen. Among his pupils may be mentioned: Melanchthon, Christopher Schilling of Lucerne, John Oecolampadius, John Cellarius, and Bartholomäus Cæsar. Reuchlin's works on subjects of specifically Jewish interest are: (1) "De Verbo Mirifico" (Basel, 1494), upon the Cabala. Baruchias, a Jewish sage; Capnion, a Christian scholar; and a Greek philosopher have a discussion, the outcome of which is a declaration of the supremacy of Jewish wisdom and of the Hebrew language. (2) "Rudimenta Hebraica" (Pforzheim, 1506). As the first Hebrew grammar written by a Christian its many faults may well be overlooked. It gives only the rudiments of Hebrew pronunciation and a very imperfect vocabulary. (3) "De Arte Cabalistica" (Hagenau, 1517). (4) "De Accentibus et Orthographia Hebræorum Libri Tres" (ib. 1518). This grammar is far superior to the one which appeared in 1506, and shows the result of the thorough studies of the author. See also Graes, Ortuin de; Hoogstraten, Jacob van; Humanists; Hutten, Ulrich von; Loans, Jacob b. Jehiel; Pfefferkorn, Johann.